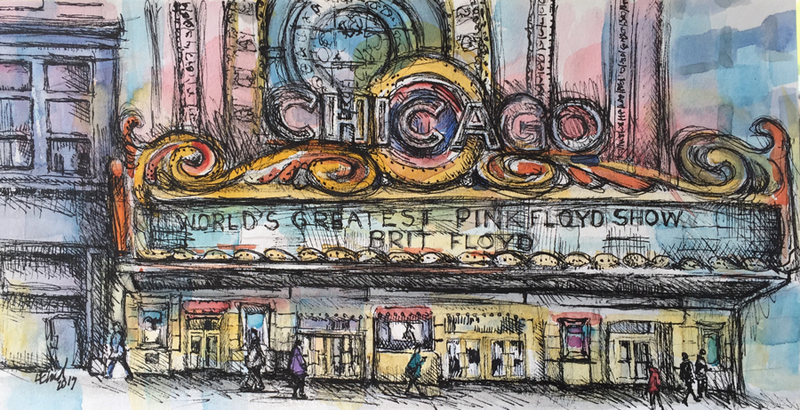 Ink and watercolor washes have combined to provide WVWS Signature member Linda Elmer with a singular set of memories. 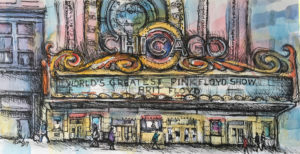 One of Linda Elmer’s ink and watercolor sketches shows a theater marquee. Click to see a larger image of the sketch. 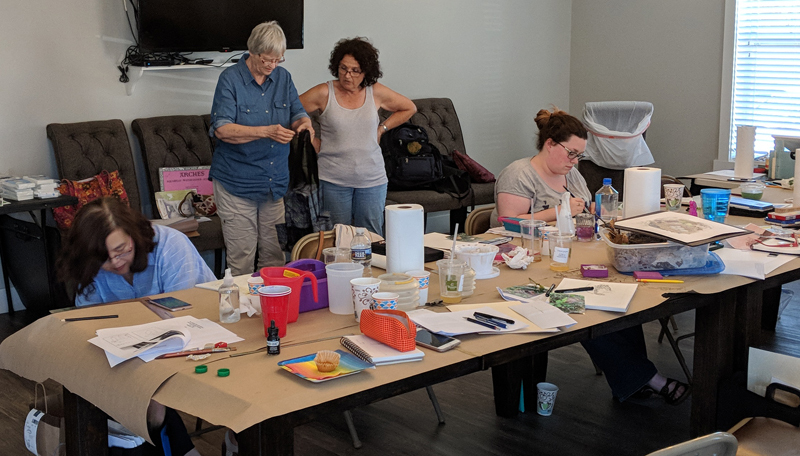 Linda shared her visions of cities such as New Orleans, New York and Chicago by opening the pages of her sketchbooks for WVWS members and other interested artists as the group enjoyed a recent one-day workshop on July 7 on drawing and sketching. Linda develops her drawings with applications of hatched and cross-hatched waterproof ink. She also often accentuates the drawings with watercolor, and she builds the sketches by moving back and forth between the ink and watercolor applications. Linda led the group through a series of exercises where she demonstrated how to use hatching and cross-hatching strokes to create darks and lights on simple objects, such as spheres, boxes and cylinders. She then provided a series of black and white photos, with a simple outline of the scene next to the photo. Class participants then practiced using hatched and cross-hatched lines of ink to create dark and light areas based on the photo references. Finally, the group went through a series of exercises to learn drawing in one-point and two-point perspective, and Linda included a series of photographs of buildings and roads to illustrate the concepts of perspective. At the end of the afternoon, participants could work from a selection of provided photographs, or work from a personal photo, to put the elements of the course together. It was a fun and informative workshop. Thanks to Linda for leading the class, Judy Reed for coordinating registration, and Jeannine Romano for securing and setting up the class location (plus drinks and snacks). Also, additional thanks to Amy Post for sharing a number handmade items that were given as door prizes.